Greetings, Friends! With less than two weeks away from Christmas I thought I’d share a quick and inexpensive DIY project for you and your children. It’s a candy cane gift basket! It’s super easy and cute to boot! I saw this cute little craft project in a Southern Living Christmas Idea book. I made some years ago and then sort of forgot about it until this year. Once I saw this big package of candy canes at BJ’s for $4.99 I remembered this simple idea. So, you’ll need a lot of candy canes….. The paint can has a straight vertical seam on the back of the can and I used this as my level, so to speak. I spread a thick layer of melted hot glue on the back of the first candy cane and lined it up on the seam. I gently pressed it into place for a few seconds to allow the glue to set. First one, done! The candy canes are not all exactly the same size and height so you can adjust accordingly as you go. I used 37 candy canes for this basket. The package came with 48 so that allowed some extras in case a few break, or you need a snack. And here it is finished! 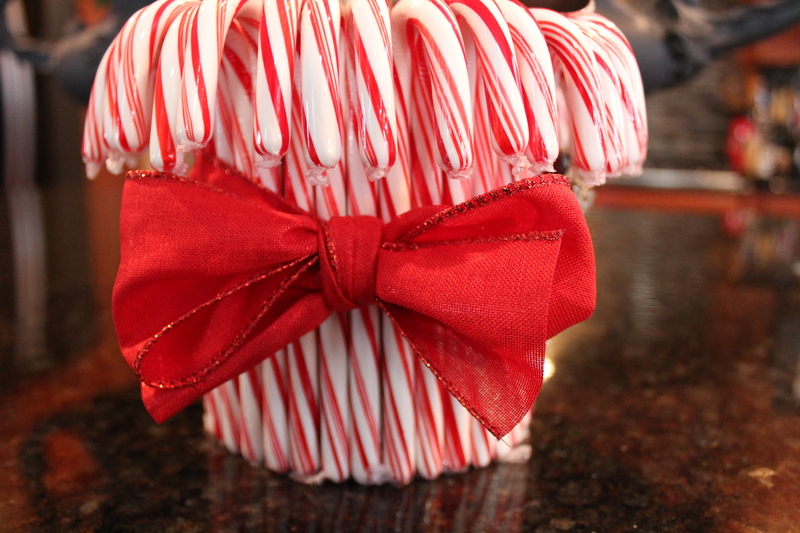 To finish it off I tied a wired red ribbon around the candy cane basket. Now it’s ready for some fun fillers! You can also add a sprig of holly or flowers around the bow, but I wanted to keep it classic and simple in red and white. Here is the candy cane basket with a Christmasy kitchen towel and some miniature kitchen tools. Perfect for that tiny baker on your list! I added a sparkly snowflake ornament just for fun. This entire project took less than 30 minutes and cost around $8. (not including the fillers) If you have your kids help, just be careful with the hot glue. As I was making this one I thought if you used a smaller container it wouldn’t require as many candy canes. You may be able to use an empty vegetable can, but one with smooth edges. Welcome Baskets for New Neighbors!